Director's cut: "Cliven Bundy is a racist, BUT..."
"Cliven Bundy is a racist, BUT..."
Thus spake Sean Hannity trying to treat The Unraveling as a Christian buffet. Sadly, this will work. There was never a question that his fans would forget (there is nothing to forgive as far as they are concerned) how eagerly Hannity had supported the welfare queen with the cowboy hat the days preceding that racist tirade. Followed by the now standard bagger practice of doubling down. After his initial tone-deaf racist speech, Bundy has elaborated on "Rosa Park," MLK Jr. and insisted that he was not a racist, even if he might have sinned by using inartful language. Those sins have been washed. Also washed is Hannity's unstinting support for the persistent lawbreaker, who threatened and threatens to use violence against anyone trying to enforce it. It had taken a comedian making a brilliant series of segments highlighting this to even register a pulse of any sort in the supposedly mainstream media. This is now a common tactic used by the wingnuts. No matter how wingnutty they get, they are instantly rehabilitated by a notpology. Note that Hannity is still fine with Bundy's refusal to pay grazing fees he owes under the pre-existing laws (, ) extended into perpetuity by St. Reagan's executive order and has never held Bundy responsible in any way for setting up a Waco-style violent confrontation. 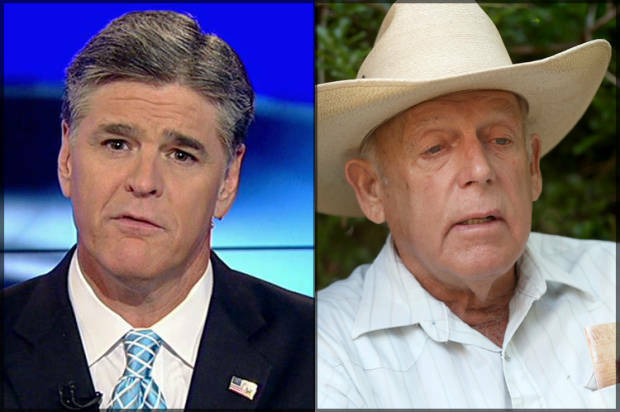 Hannity gets away scot-free because he was pronounced clean as soon as he denounced Bundy's racist remarks. This is precisely why the nonsense continues. It takes that little to undo the douchebaggery. Next up for Hannity? A continuing support of Bundy, leaving aside the racist parts, of course. Luckily, Stephen Colbert decided that, no, he wasn't going to take the high road. I'd note that Stewart did. After a couple days of exchanging pleasantries, when it was time to inextricably link the two, he bailed, moving instead to the CNN coverage of the missing plane.